Earn up to 11,200 reward points. All the greatness of the original rack-mounted Multiamp, with lots of added flavor. Frank Gambale and DV Mark worked together to develop an all-in-one amp that compliments his remarkable sound and technique. The incredible tones of Frank's signature amp called Ampli-tude are now added to the virtual amps, incredible effects, features and programmability of the Multiamp. Plus, there are 20 finely crafted presets by Frank built in also.The result is the special edition Multiamp FG. The special edition Multiamp FG (Frank Gambale signature) adds to Multiamp the incredible tone of Frank' signature amp and various amazing FG presets finely crafted by Frank! 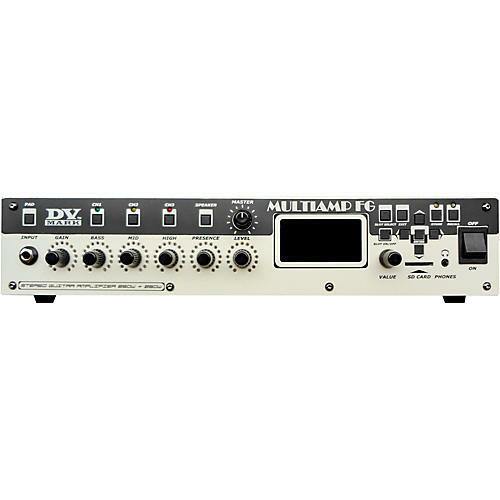 The Multiamp features everything a guitar player needs: three fully programmable channels (clean/crunch/lead), and a vast array of virtual amps, speaker cabs and microphones, studio effects, powerful stereo power amp and tuner. It is great feat of technology, and a very user-friendly creative tool! Thanks to its cabinets and microphones emulation plus amp simulator and effects, it offers incredible flexibility. We've still managed to create a user-friendly interface which makes it very easy to use, and you can store all your favourite presets for stage and/or studio. Multiamp's state-of-the-art design allows for continual expansion through new firmware updates (available for free download at the DV Mark website) adding new items, new features and more and more useful and exciting tones and effects. The Multiamp FG has a powerful 150+150W@8ohm, 250W+250W@4ohm or 500W@8ohm (in bridge mode) power amp, that makes its amps and effects sound great at any volume!